"A cottage razed in the '94 bushfires has been rebuilt to safe and sensational effect on the edge of sparkling Lovett Bay." 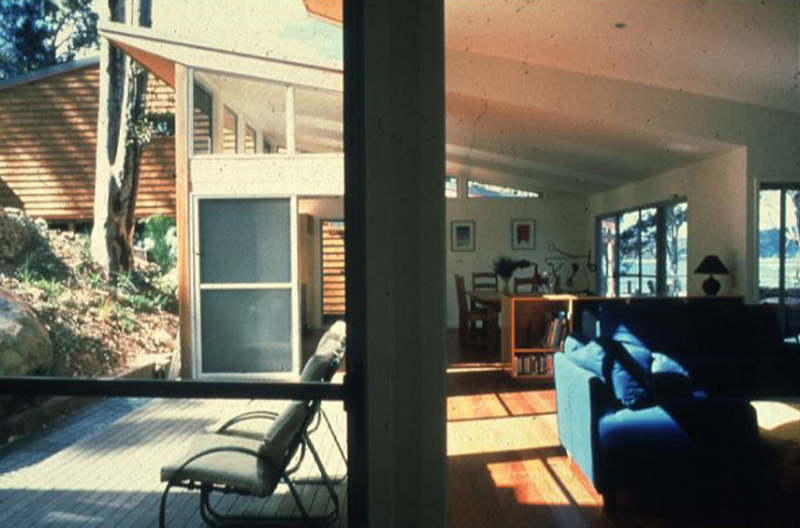 Located on a steep-sloped waterfront block in Lovett Bay Pittwater, the original house was destroyed in a bushfire in 1994. 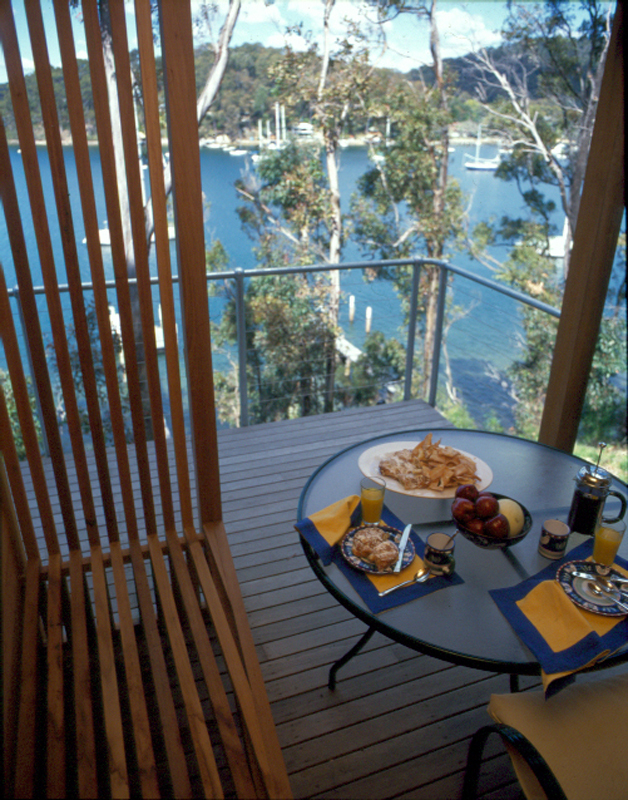 This site is sandwiched between Pittwater National Park and the estuary off Pittwater. With access only by water and subject to accute bushfire conditions, the approach to construction that could effectively reduce its exposure in the future was paramount to the design resolution. Other challenges included caturing sun from the hill above while mazimising the water views to the south. The house is designed as a series of simple timber boxes arranged in a step formation following the contours of the site. The boxes are interconnected by a light-filled atrium which serves as the vertical and horizontal circulation space. The simple skillion roofs have been peeled back and extended to allow winter sun to penetrate deeply into the house, while giving shelter from the high summer sun. Doors on both sides of each room can be left open on hot summer days for cross-ventilation, and frame the views to both the water and bush. The living-room pavilions have been staggered to provide a generous south facing deck looking out to the bay as well as a protected north facing courtyard looking up to the bush. Due to the delicate and unstable nature of the site, the house had to be constructed using lightweight construction. Existing levels, rock outcrops and trees were major influences on the form and planning of the building.The underlying 1200 x 1200 grid allowed for economic construction and simple construction. All materials had to be sized for manual handling on this difficult-to-access site. 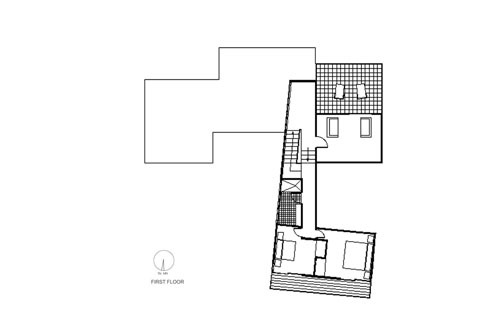 The house collects and uses it own rainwater and deals with its own sewerage on site. Recycled timbers were used extensively throughout, as were natural paints and finishes. Attention to planning and detailing to manage acoustics. House wired for future installation of photo voltaics for energy generation. House is totally self sufficient for water and sewerage. High performance water saving fixtures and appliances. House designed with modular and standard sizes in mind to reduce waste. Size of project purposefully kept to the smallest possible.